Note: After a follow up with several local historians, some of the information in this story needed to be corrected and/or clarified. Heise came to Galion in the 1880s and worked as a patternmaker. 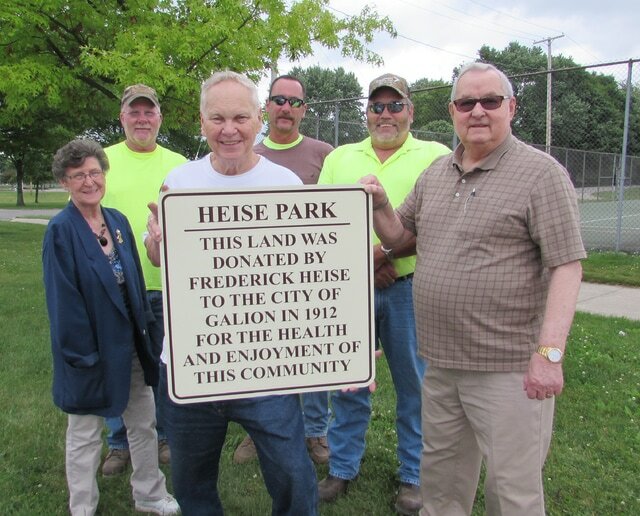 In his unsigned will, he left a reported $10,000 to the Galion Public Schools, which used Heise’s gift to purchase land from B. B. Gill. The deed of transfer was filed in 1913 and the park was named in honor of the German immigrant who had loved this town. Rich Henry, a member of the Galion Historical Society, said he had been wanting to put up the signs for a long time. He talked to Safety-Service Director John Swain to see what could be done, and the city agreed to make the new signs. They are located on Heise Park Lane at both the east and west entrances, as well as the Jefferson Street entrance beside the tennis courts.